Irish step dancing is a traditional form of dancing that is passed on from generation to generation. Many Irish dancers often start learning the fast-footed moves at a very young age — like this 3-year-old, for example. The adorable little girl’s performance was put up on YouTube and has since garnered over 845,000 views — and growing! She was performing her Irish dance moves at a dance and art festival called Feiseanna, or feis, for short. 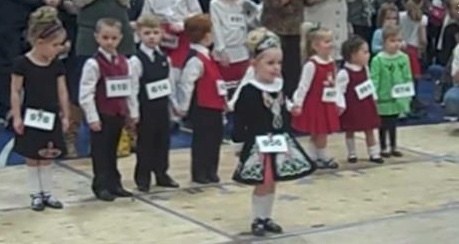 It’s this little girl’s first feis and she walks on stage donning the very important traditional Irish costume. Costumes are a big part of the performance and as a 3-year-old, she is, of course, absolutely adorable. The precious toddler walked on stage with her costume, complete with a cute headdress; but, she seemed a bit nervous and shy to have so many people staring at her at once. An adult needed to walk out with her and give her a little talk to boost her spirits. When she starts dancing, though? Everyone is completely blown away. They would have never expected such a flawless performance from someone so small and only a few years of age. She won everyone over. Her little feet were moving fast and she was kicking them around the dance floor. Everyone watching her has a huge smile on their face. And you definitely will too. Her kicks are high and her precious little toes are pointing — the 3-year-old dancer isn’t missing a beat and we couldn’t love it more. It’s clear that the internet was too because it is viewed more and more by the minute. Even parents were commenting on YouTube about how impressed they were by her coordination. Watch and SHARE this precious performance and tell us what you thought in the comments below! Way to go little one, we can’t wait to see your future performances. Very talented wee girl, a champion in the future for sure! What a little sweetheart. She’s lovely and very talented. Wow amazing she is adorable. Could this be miss nellie in a couple of years?